Click images to view larger photo. Scroll to bottom of page to order. Splinted Cuisses were a common defense for the thigh for an extended period of time and can be appropriate from the late 13th century to the mid and even late 14th century. WTC's splinted cuisses, due to using overlapped splints provide a level of rigidity and protection approaching that of full plate cuisses while also being far more adjustable and easier to fit (and more economical). They are constructed with premium 8-9oz English Bridle leather backed by .040" heat-treated 1050 medium carbon steel splints which are affixed by brass solid-shank hammer peined rivets. 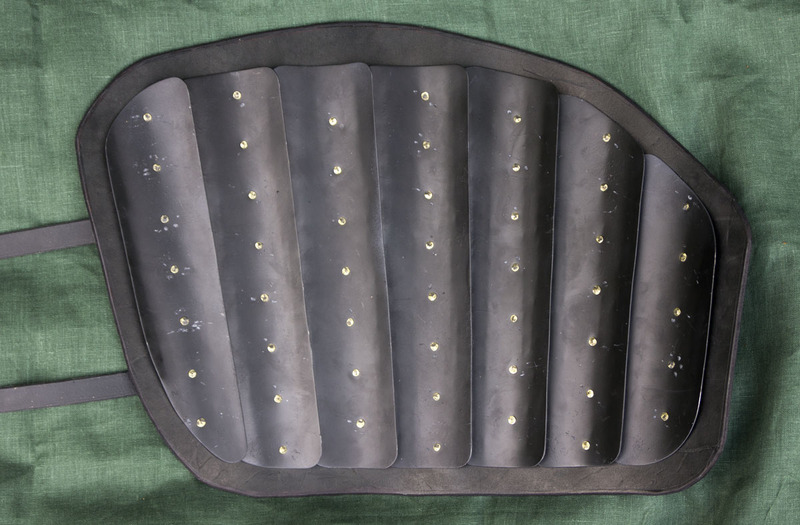 English Bridle leather contains a higher than usual amount of waxes and tallows which make it ideal for use in armour for its resistance to sweat and moisture as well as its inherent durability. The edges of all splints have been carefully beveled to present no sharp edges to the wearer. A large splinted cuisse will weigh approx. 2-1/4 lbs. These cuisses come fully strapped and feature buckles which are made in-house of welded steel rod and are left black from the fire. 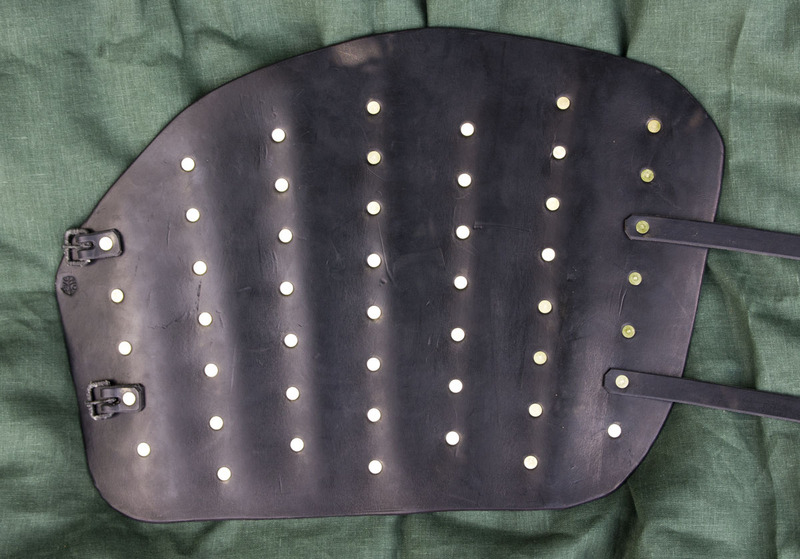 Holes for arming points can be pre-punched in the leather but it is often best for the customer to punch or drill these holes in the leather themselves to ensure best placement. Shown bottom is a splinted cuisse with poleyn over gamboissed cuisses (padding).